Today I went to my first ever protest. 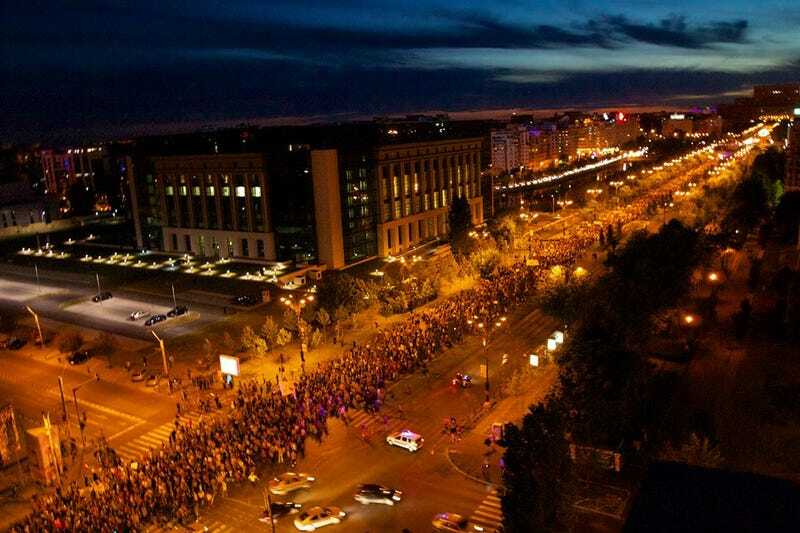 And boy, did I pick it: the largest protest in Romania since the 1989 revolution. So what mobilizes so many people after 23 years of inertness? What could be Europe's largest open-pit cyanide mining operation. After about 15 years of back and forth on this project the government has proposed a law that is a complete travesty in order o finally give the go-ahead to said gold mine. That law breaks logic, Romania's constitution and ignores so much of what independent experts (as opposed to the corporation's own) that the only explanation for it are hefty bribes. This article details the law and why it should never pass. Need I mention the current parties in power explicitly stated that they would ban this project while campaigning? After a week of protests the prime minister and senate leader have declared the project dead. That was Monday. Since they've been giving that the run-around. So the protests are getting increasingly larger. So here I am, protesting for the very first time. I've been a volunteer for an environmental NGO for a while now, but I hope that even if I wasn't, I'd see the idioticness of this project. If not for the environmental side maybe for the lawless side, one that would set a dangerous precedent. And it wasn't just me, thankfully. There were between 15 000 to 35 000 other people there. Numbers vary, because the national media has either completely ignored the protests or have been reporting wildly inaccurate accounts with a bias towards the RMGC company (the one that would run the project). Must be all that advertising money they've sunk into all the local networks. Today they've reported 3000 people protesting. See that pic up top? That's a 1 km stretch of road that you can see. So this is what's been going on around here. Hope you had a nice weekend!